an unfamiliar sound this morning while i was in the bathroom taking a shower turned out to be my roommate returning from his spring break (which he didn't have the courtesy of letting me know, but i figured it out after i went the whole week without seeing any signs of him). we didn't speak, he came back to the house and went right into his bedroom, after i was done with the bathroom i got dressed and left for work. 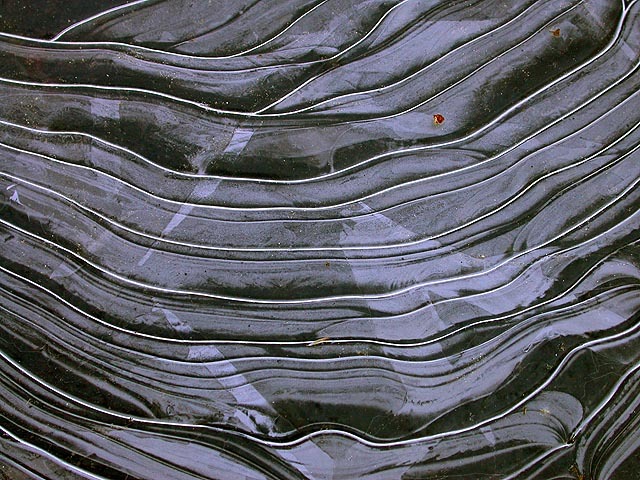 outside, i saw ice puddles with wavy rings of freezing. winter struggles to stay alive as every day more and more signs of spring show up. though it's only tuesday, it felt like i've been at work for many days already. while fighting my illness, one work day feels like several work days. the cough shows no sign of letting up, although the constant consumption of teas and cough drops do offer some relief. on a whim, i decided to call my doctor's office and left a message, figuring i couldn't possibly get an appointment for this week. a secretary called me back a few hours later to schedule an appointment tomorrow after work. some professional medical advice finally! one of the reasons i avoided seeing a doctor is because he'll just prescribe antibiotics, and i was doing my part for society by not going that route and therefore not chancing the risk of producing antibiotic resistant strains of whatever i got. at this point though, why suffer needlessly any longer? let the miracle of modern medicine be my friend, nobody asked me to be a martyr to viral mutation. a day of bug fixing, there was a somber vibe at work despite the fact that we had the radio on pretty much the whole day to add some music to the monotomy. can't quite place my finger on it but i have my theories. i was in the front room for a good part of the day, cut off from the rest of the office, without any internet access. when i did use my normal office computer, i was getting any personal e-mails (later i realized i accidently turned off my account). i had some dao hsiao shredded pork noodles from the noodle alcove ($5), and wandered around chinatown a bit while waiting for my order. the chinatown buses are gone. the bus stops must've relocated, or maybe today was an especially slow travel day between boston and new york city. my roommate left as soon as julie arrived. 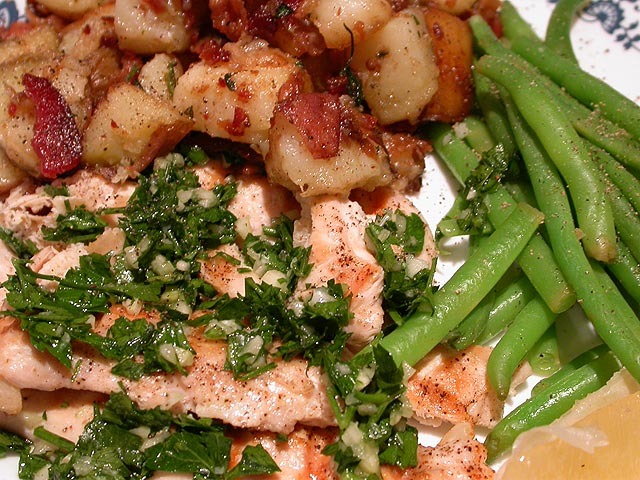 i made grilled chicken with gremolata and cripsy potatoes with bacon, garlic and parsley, the two recipes i was going to make saturday night but didn't. julie brought over some string breans. it was my first time working with bacon, if you can believe it. say what you want about rendered pork, but it smells really delicious when you cook it. as julie observed, gremolata is a lot like tabouli without the tomato: chopped parsley, garlic, sea salt, olive oil, and lemon zest. it has a really distinctive flavor and went well with the relative blandness of the small pieces of chicken breasts (which i marinated in olive oil, salt, and ground pepper), cooked using the foreman grille. it was a tasty meal, although unfortunately something didn't agree with julie and she had stomach issues throughout the night. we think maybe it was the bacon fat (which the potatoes were cooked in until crispy), rich in flavor, but if your stomach isn't used to that level of grease, it can give you a bad time. tonight's episode of queer eye: another makeover dad episode featuring a mullet+moustache sporting father. i think the 18 year old step-daughter was the one that really lucked out, with her new flat screen plasma television, ibook, and ipod, the accoutrements of cool. the father was so mellow, his laid back style was almost hypnotic. julie left, i brought out the trash, washed the dishes, and called it a night. can't wait to see the doctor tomorrow! a cure is in sight!